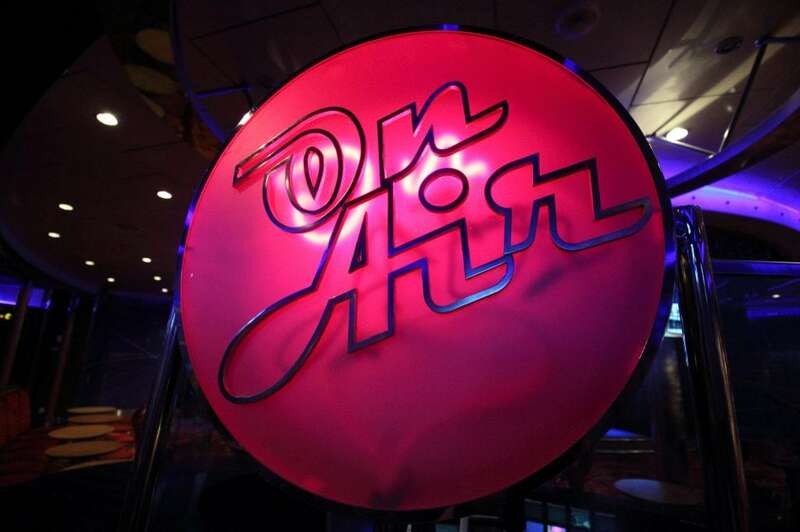 I have just returned from my first ever Royal Caribbean cruise onboard the Independence of the seas! 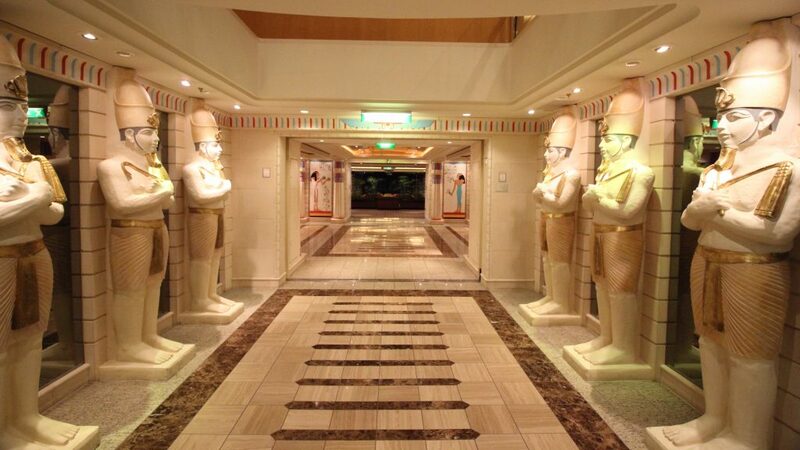 I booked the cruise to try Royal as I had heard really good things and wanted to experience them for myself. 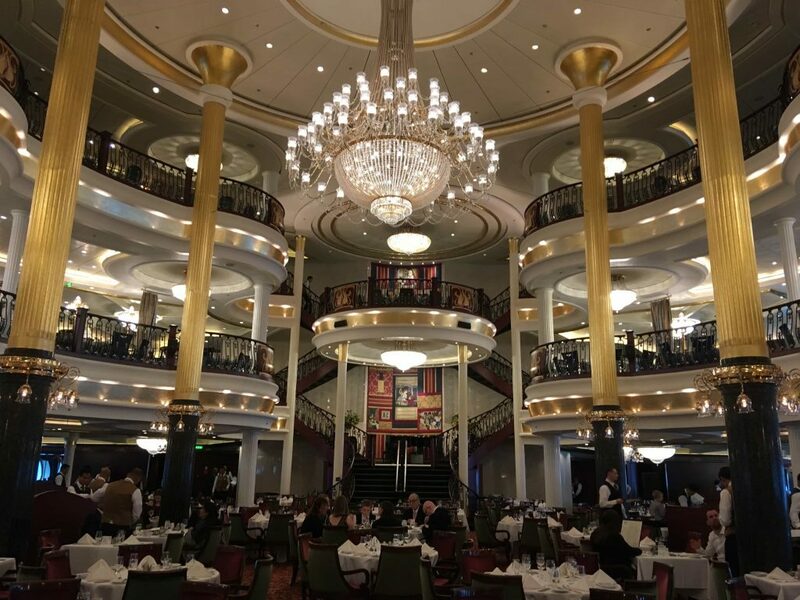 There was SO much to do onboard the ship, it was difficult to explore everything in 5 days. We visited Bruges, Rotterdam, Le Harve, and Cherbourg on a little adventure which departed from Southampton. I stayed in an inside cabin, no surprise there! I had read reviews before cruising that the ship was looking run down and in need of the refit that she is due to have next year. I’m happy to say I didn’t find this to be the case at all. The cabin wasn’t particularly exciting, it had a little bit of a caravan-y vibe but it was perfectly clean, tidy and comfortable. 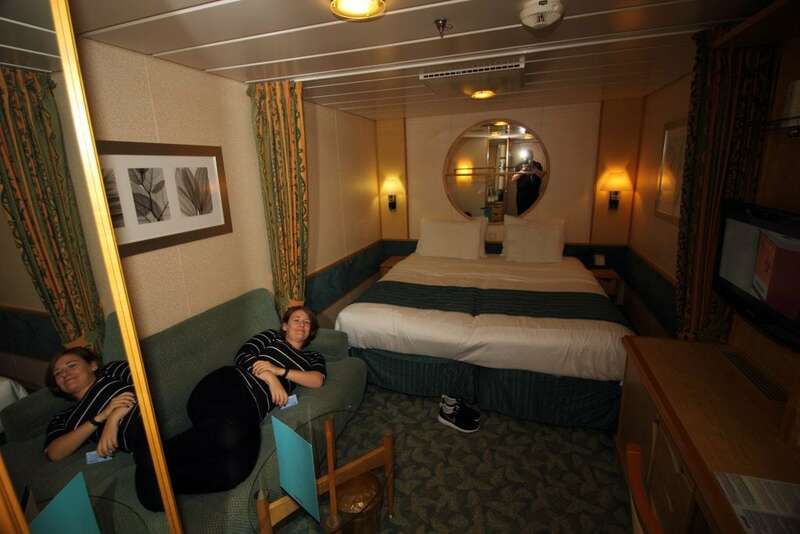 We even had a sofa in our inside cabin which I have never had before, it was really nice to be able to sit down there rather than always perching on the bed as I am used to. I will be bringing you a full inside cabin review soon, so watch this space! My parents and brother also cruised with me during this particular holiday. They were in another inside cabin which meant I got to have a look at how 3 (or 4) people can fit in an inside cabin. The 3rd and 4th beds hang from the ceiling. I did film a video about this (where I nearly fell off the bed). Coming soon! 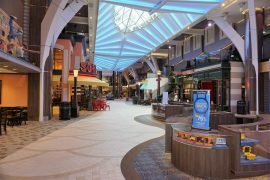 The promenade is one of the most iconic things about Royal Caribbean ships. I was absolutely blown away when I walked down the street for the first time. 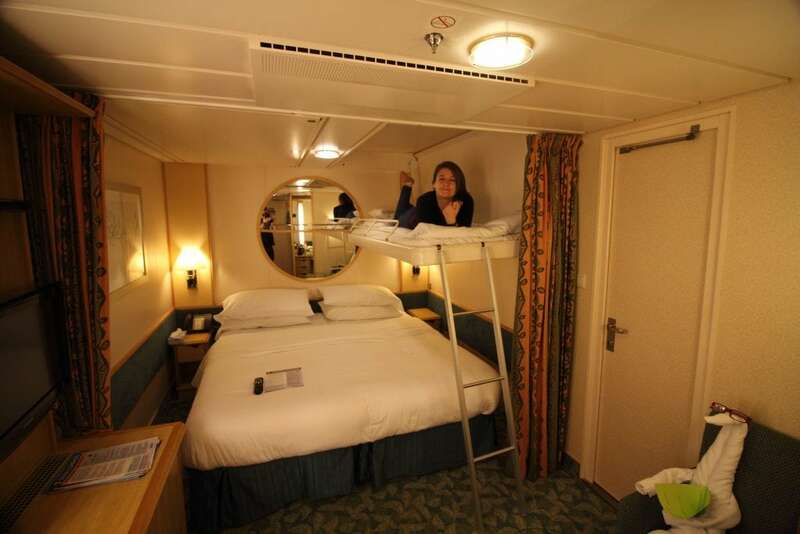 I’m not sure if I would want one of those inside (but into the promenade) cabins, it would be strange to have people peering into your bedroom at all hours of the day and night. I imagine it might be loud too when the street parties are happening (although they don’t last for long). Check out the video below to see the promenade preparing for the dancing in the street party. The street parties were really fun to walk through, it was strange though as they don’t really have anywhere for people to stop and watch, I always felt a little in the way. 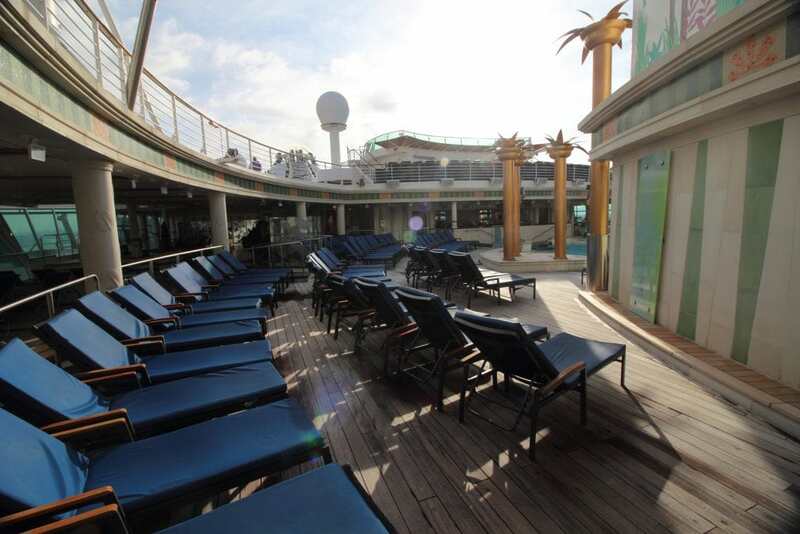 I did, however, find my favourite lookout spot on deck 8! 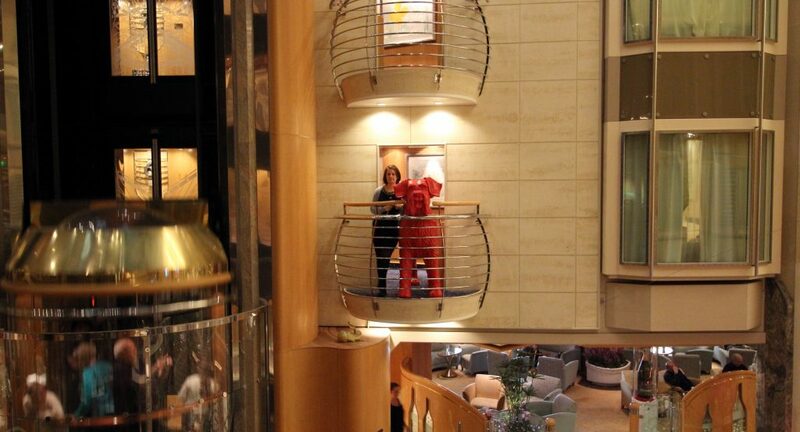 I like how there was a big red dog on one of the little balconies, it was strange as you walk down the corridor behind him as you just see a couple of red legs sticking out. 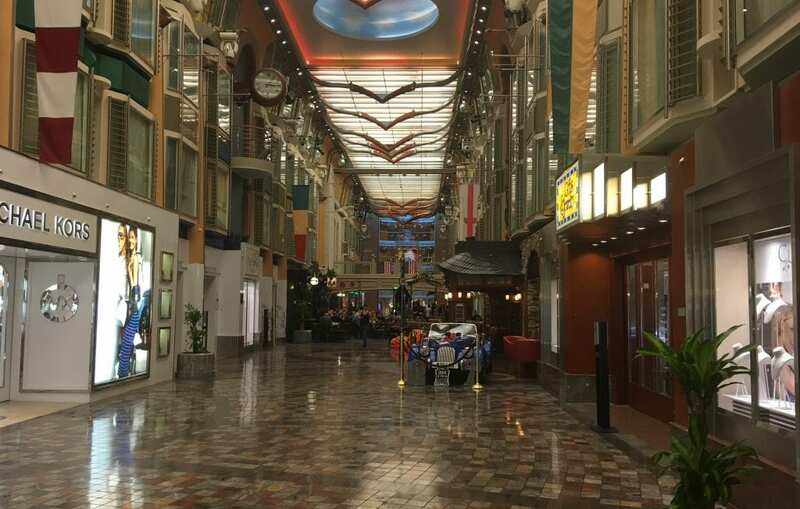 The promenade was filled with shops and other things to do. They had a cupcake store and a ben and jerries shop, but I was disappointed though to find out that you had to pay extra for these. There was a gift shop where I bought an inflatable independence of the seas (because why not?!) A pub and wine bar are also located on the street and people often sat out on the tables in front of the pub, watching the world go by. One of the best things about the promenade is Sorrentos, a 24-hour pizza restaurant! I don’t eat dairy so couldn’t ever eat any pizza (boo) but did appreciate the idea. Jono certainly appreciated a slice of late night pizza. 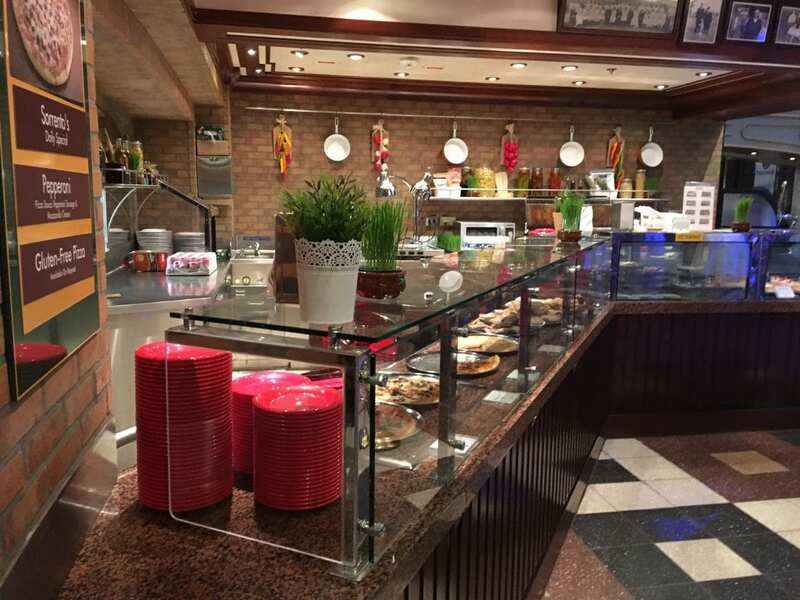 There is also a cafe which has a little selections of cakes and sandwiches. Again because of the dairy thing I could only eat a cake once.. (boo again). 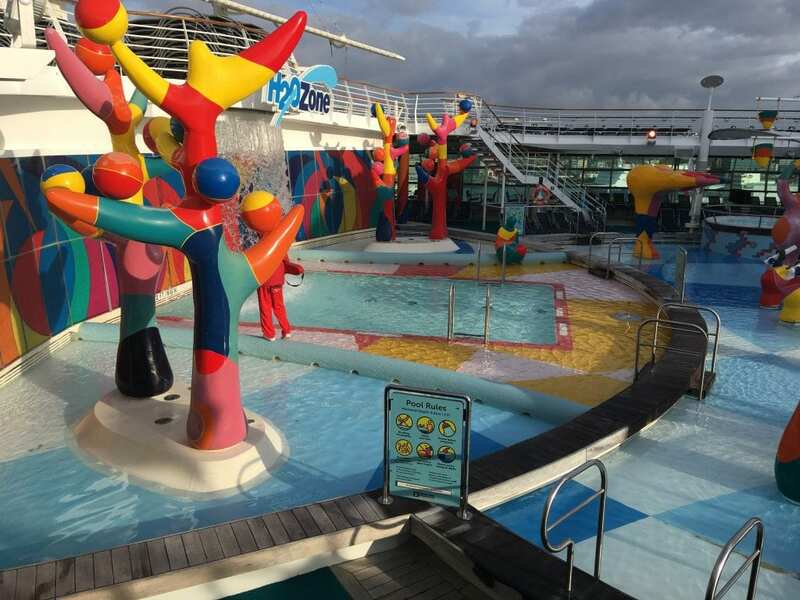 The splash zone part for kids was huge and looked like so much fun, almost makes me wish I was a child! I loved the Flowrider, it was SO much fun. If you want to see how I got on, check out the video below…. There was also a rock climbing wall and basketball/football court. We did see different groups of people playing basketball and football at the same time which was confusing! The walls around the court were also a lot shorter than what I am used to meaning that the odd ball did come flying over. It was always too busy to give the golf course a go, I did travel in half term though so the ship was full to maximum capacity. 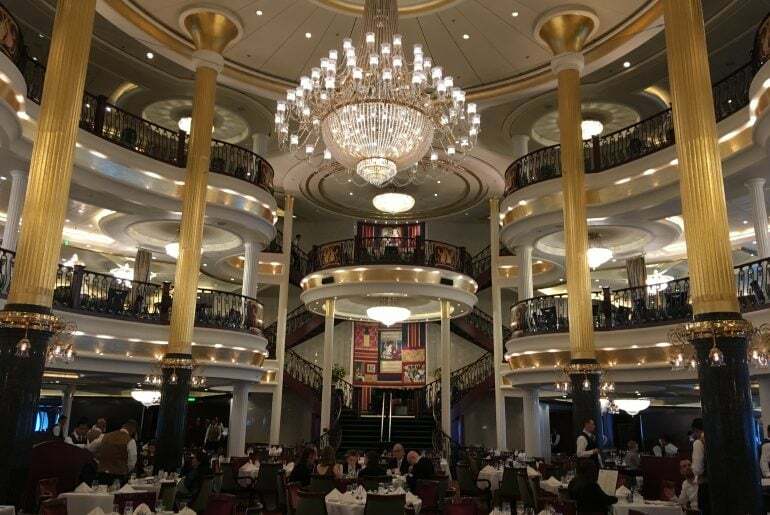 I thought that the main dining room was gorgeous, it was spacious and tastefully decorated. We were always seated on the ground floor as we opted for ‘my time’ dining. (I wasn’t really a fan of my time dining but more about that to come later). The main dining room was open in the middle, which made the room feel a lot more spacious, I cannot comment on the other levels of the restaurant as I never managed to get up there. 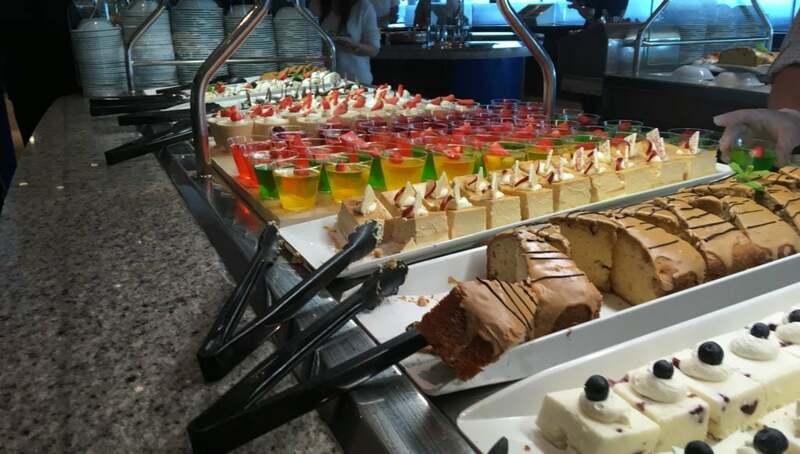 They did have a buffet breakfast in the main restaurant which I enjoyed. 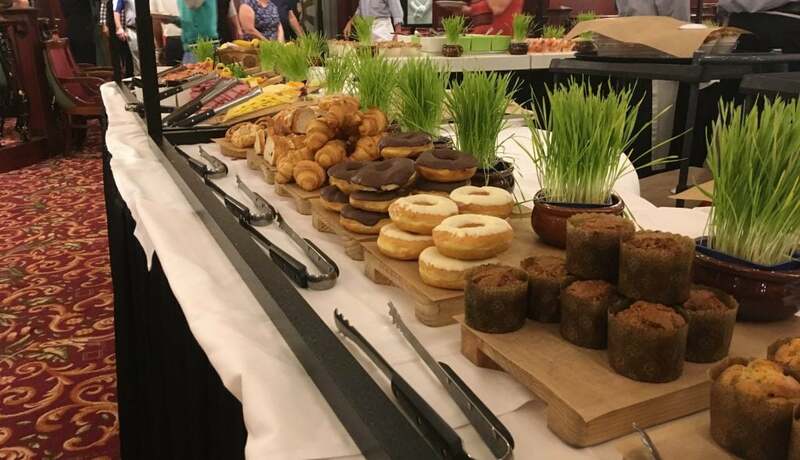 I am not really a fan of breakfast so don’t like to sit down and have a formal meal, the buffet can get crazy at peak times though so I was glad to find this go-between. The only thing that would have made the restaurant better for me would have been some more windows. 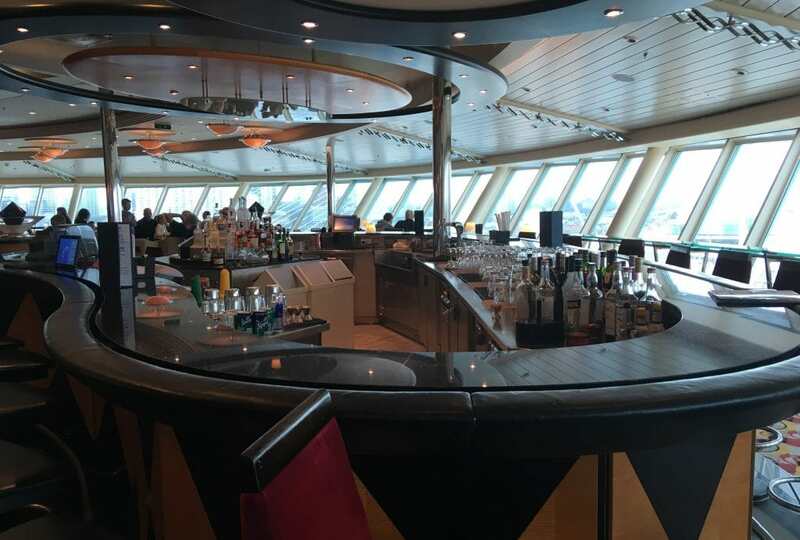 I do enjoy a main restaurant which has big windows (usually at the back) like the Norwegian Spirit. Not a lot they can do about that though when the ship is already designed, I don’t recommend that they start putting in windows here and there! Johnny Rockets was fun! I’m glad that I went. I will be bringing you a full review of this so keep your eyes peeled. We sat outside and had the full ‘song and dance’. It was all really yummy. 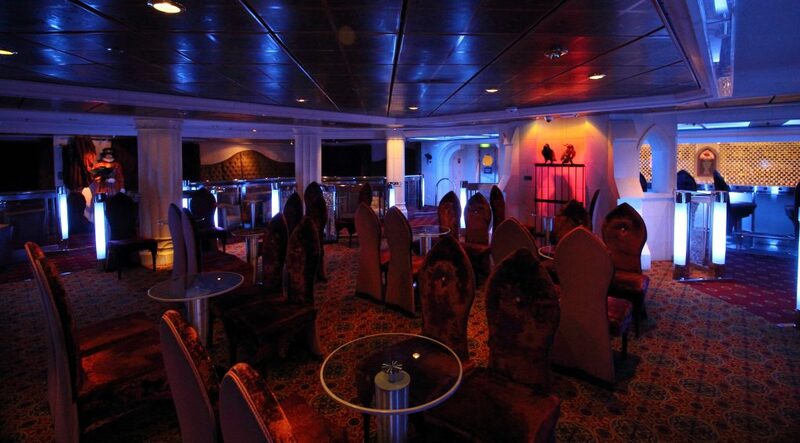 I really loved the labyrinth club onboard Indy. It is a club designed with a ‘tower of London’ theme. Lots of crows and gothic chairs/doorways! They are able to ID people on the door which I found a little strange, who carries their ID around with them when on a cruise? I definitely don’t. Onboard NCL they cut off the corner of your cruise card if you are under 18. We spent a lot of time in this bar, watching the world go by. 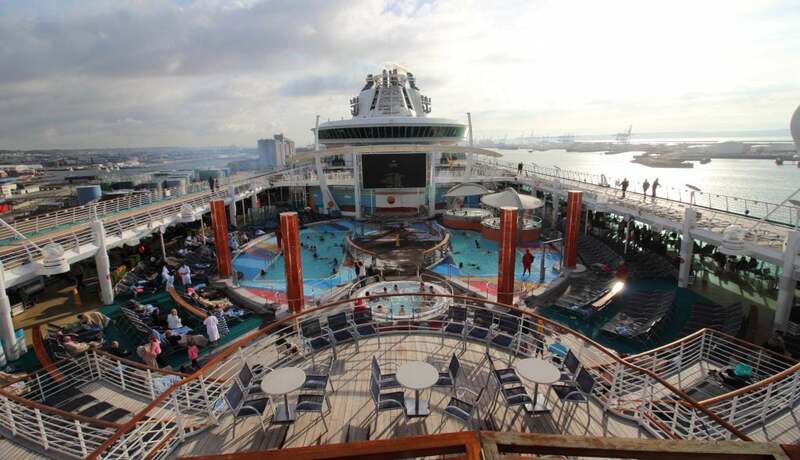 From the top, you have the best view of the rest of the ship, a fantastic place to watch a sail away. They also had some really comfy chairs which we would make use of after a long day exploring the port. The bar had a place set up for a band to play although we only saw a band here on the last day. We took part in a couple of quizzes at the Pyramid lounge. It was a strange lounge because it didn’t really have a lot of light (due to lifeboats outside the windows). For some reason it always seemed quieter in here than around the rest of the ship, which made it an easy place to grab a drink. The ice skating rink is SO cool. Who’d have thought it?! An ice skating rink on a ship. 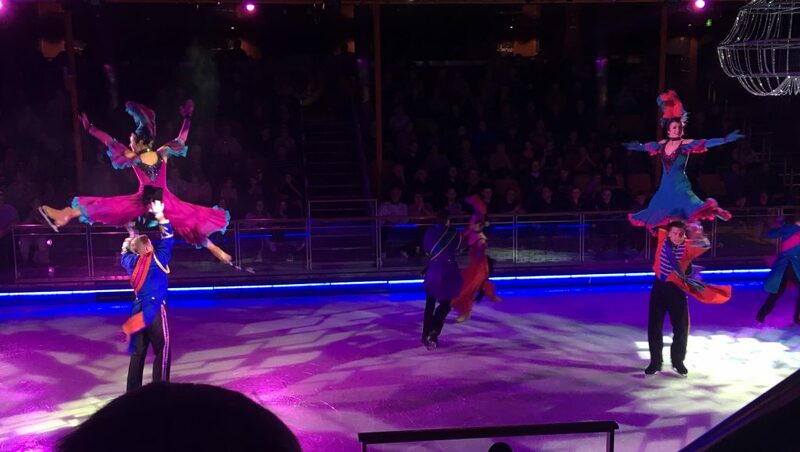 I was really surprised by the size and was amazed when we watched the ice skating show. There were so many ice skaters all skating so close to each other, it was a little bit terrifying, but really good fun. They also use the ice skating rink for other events, we watched a game of ‘quest’ here late one evening. During the game the team captains have to get things from their side of the audience, an example might be ‘find me a pair of sunglasses’. The game escalated quickly and the teams were soon looking for bras, trousers and even dirty dancing. It was at this moment I realised that this cruise would be pretty different from my last, onboard Cunard’s Queen Victoria. The theatre was huge and we enjoyed a lot of shows here. 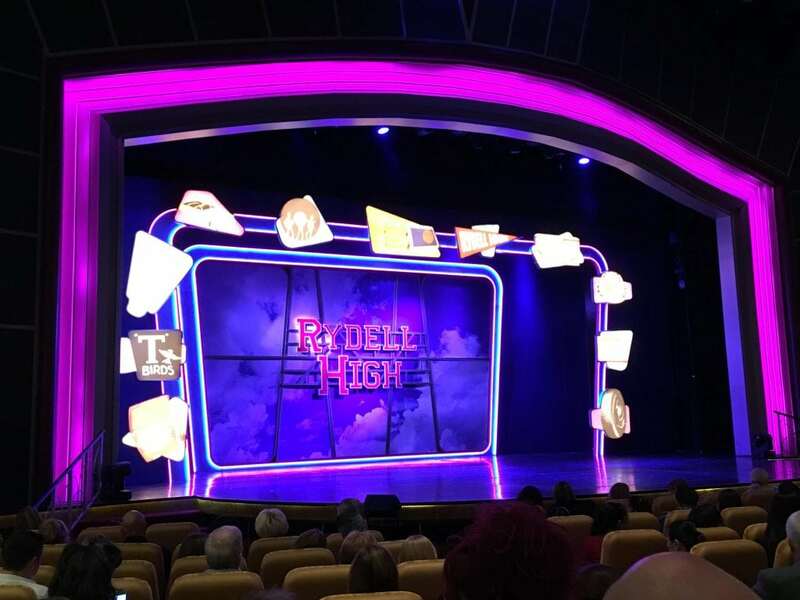 We watched Grease the musical, the Take That experience and various comedians/magicians. 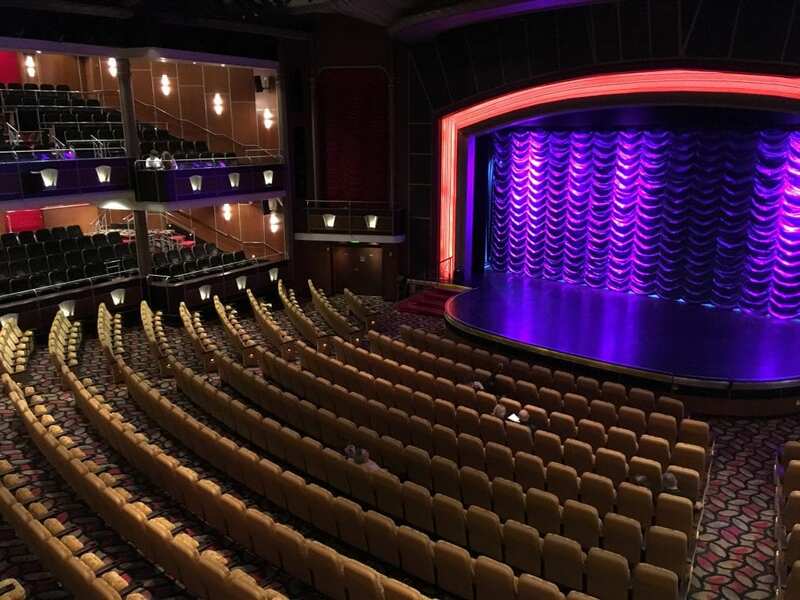 On Royal Caribbean ships you don’t have to book to see the shows but that means that you do have to arrive early to make sure that you get a seat. 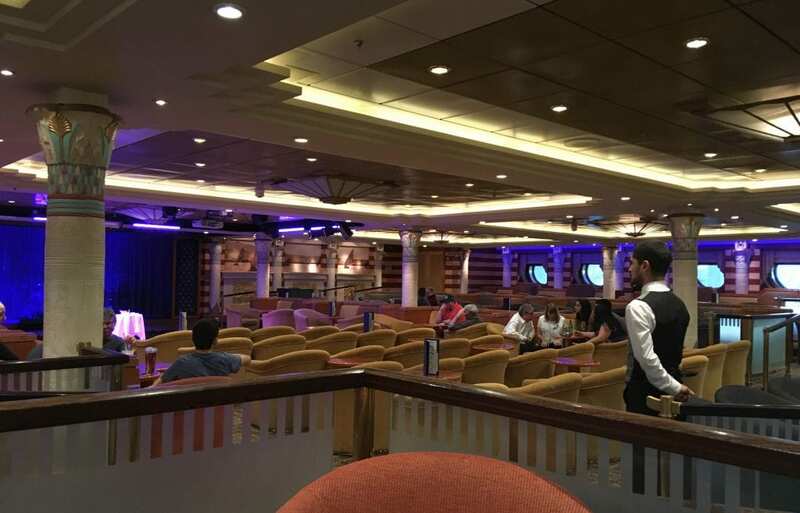 We were on a 5 day cruise and they had tried to squeeze as much entertainment into the 5 days possible, one some days they had more than one show. 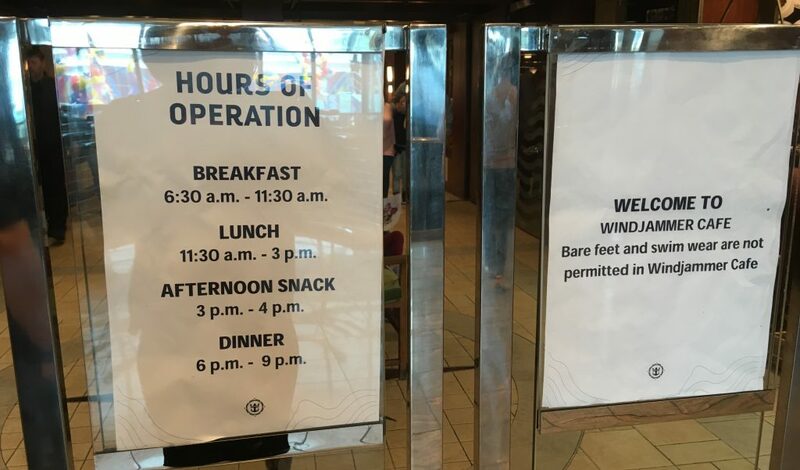 I loved the Independence of the seas! 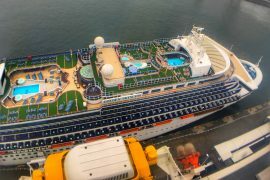 She has so much to offer but I don’t think I really had enough time to try everything on the five-day cruise, though I gave it my best shot. 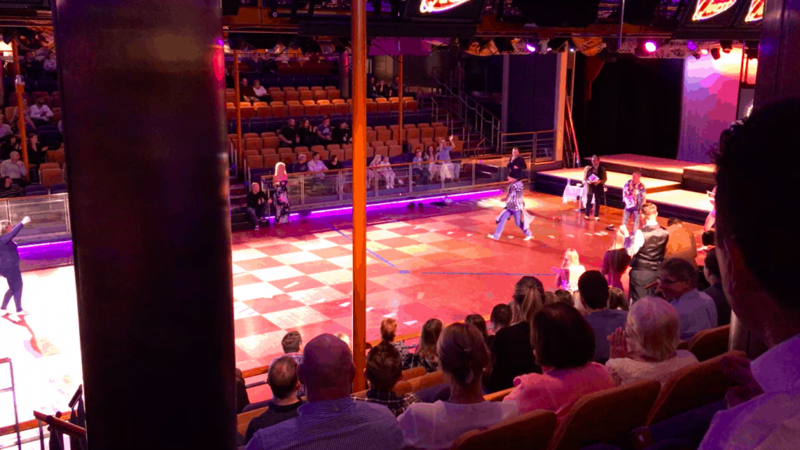 I would definitely consider cruising with Royal Caribbean again and would wholeheartedly recommend the Independence of the seas. 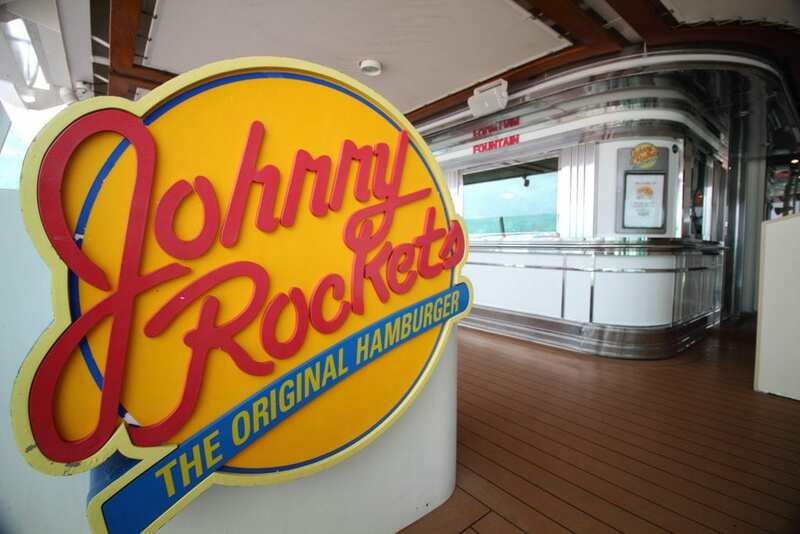 I’m going to have a lot more content coming about this, so make sure you stay tuned for my cabin review and a number of videos about my favourite parts of indy, Johnny Rockets etc! 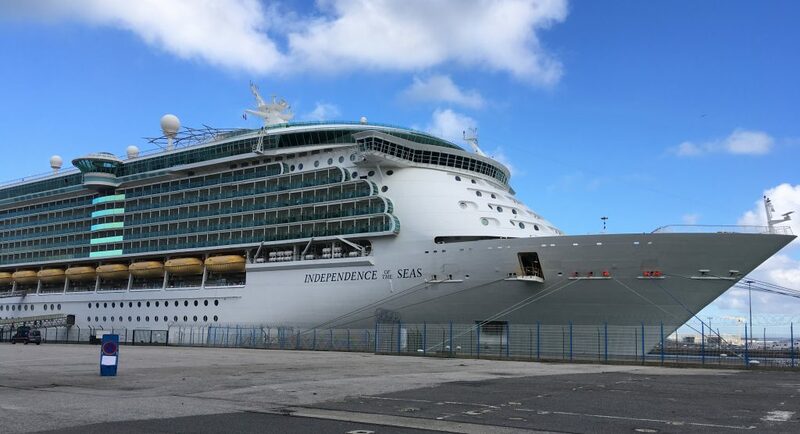 To see the full Indy gallery click here: Independence of the seas. Fab review! She looks nice though you can see she’s a bit dated, esp the cabins… interesting to see what the refurb will bring. Doing up the cabins would be so worth it but they rarely touch cabins in any great detail it seems, just upgrade the public areas… Fingers crossed! 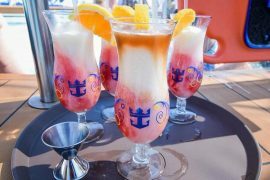 Great write up Emma, and I’m glad to hear you had a fun cruise as I’ve so many good memories onboard Independence. The shows are fab and The Quest is a good laugh! 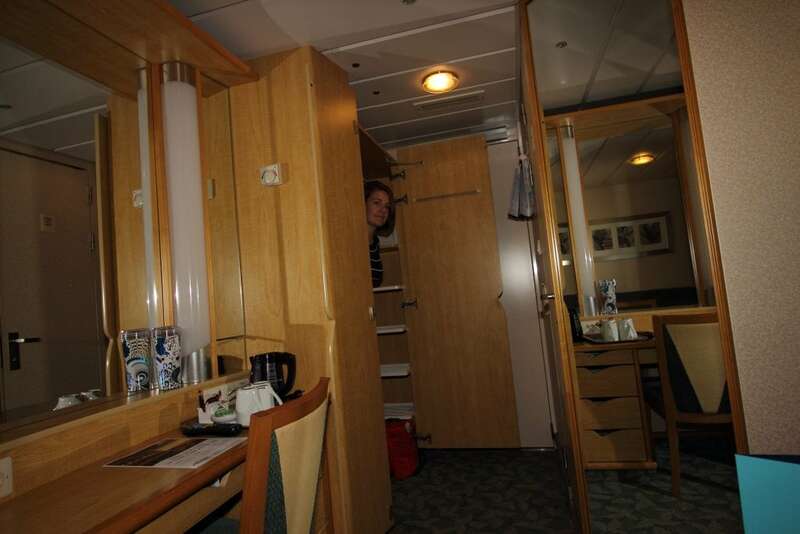 Like Sanna said, I’m looking forward to seeing the ship refurbished, the proposed changes are very welcome from my pov. Very nice. Thanks for writing. 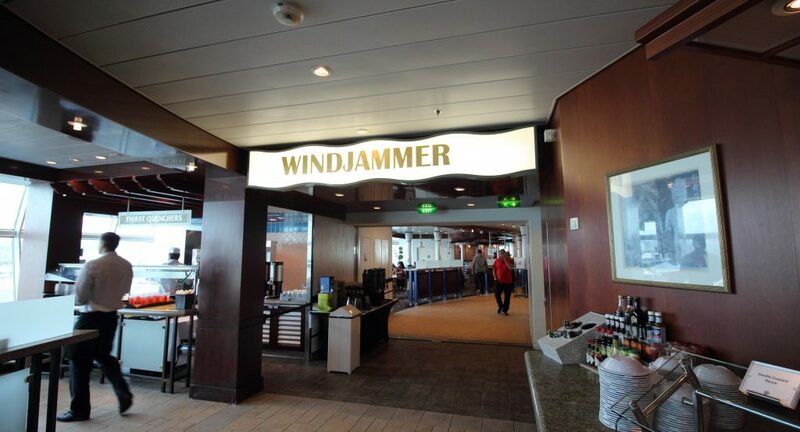 I echo your thoughts on the Windjammer closing! That’s always seemed absurd to me. I remember discovering same on the Explorer of the Seas in 2006. Very irritating indeed. Great review Emma, the kids areas look brilliant! Thank you! It did look like lots of fun. The kid’s zones inside looked cool too, the arcade was huge! We love the Indy and hope to sail on her again particularly after the refurb to see what they will do! The pub and the wine bar were good viewing points for parades etc when we were last on her. Great review! Oh yes! You have to get there SOOO very early to get a seat there for a party though.